Associated with relief from physical injuries and nerve tissue protection. ¤ R-alpha-lipoic acid is the form of lipoic acid produced naturally by the body and the only one which acts as a mitochondrial enzyme cofactor. 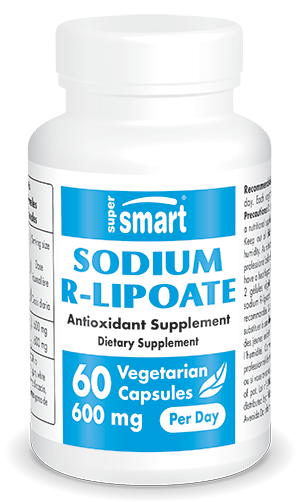 Sodium R-lipoate, a sodium salt of R-alpha-lipoic acid, has much greater bioavailability than R-alpha-lipoic acid. It rapidly produces blood levels 10 to 30 times higher than is possible with pure R-alpha-lipoic acid. More stable and more easily soluble in the aqueous phase, it is much more easily absorbed. may increase production of acetylcholine, an essential neurotransmitter of the nervous system deficient in the brains of those with Alzheimer's disease. Each vegetarian capsule provides 210 mg R-lipoic acid. Take 1 to 2 vegetarian capsules a day or as advised by your therapist.